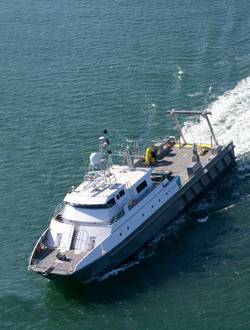 At 134-feet (40.8 meters) in length the research vessel Sea Scout is the largest catamaran built by All American Marine in Bellingham, Washington and the largest vessel designed by Nic deWaal’s Teknicraft Design of Auckland New Zealand. With its length and 37-foot 4-inch beam, this is not only a large vessel it is, as C&C Technologies Survey Services newest vessel, a highly sophisticated and complex craft. A vessel such of this has a dual personality. The first being a crewed vessel designed to get from place to place in an efficient manner. The second is to support a team of technicians with specific goals. As a purpose-designed craft, the Sea Scout has some interesting innovations. A large clear after deck is fitted out to take C&C’s custom built containers for storage and operation of their autonomous underwater vehicle (Konsberg Hugin AUV CSIV). A large stern gantry (14,000 pounds, 16-foot swing and 8-feet clear over stern) and smaller side gantry are designed to facilitate the deployment of the AUV and other instruments. A Morgan Marine Crane is mounted starboard-side and is capable of lifting 4,158 pounds at a 36.75-foot extension. Deck equipment also includes a side scan sonar winch (Klein 5000), a coring winch (piston & box), and a CTD winch with water sampling rosette. With four propulsion engines, the Sea Scout can make 28 knots and cruise economically at 20 knots. This is great for getting to and from jobs in the offshore oil and gas industry but for much of the time the boat will be working at speeds under ten knots. 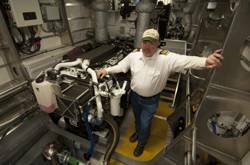 To meet these variables, the boat has a 1600 HP 32C ACERT and a 553 HP C18 ACERT Caterpillar engine in each hull. Each engine turns a prop so that for commuter-speeds all four engines can be employed while for slow speed survey work the two small engines will do the job with significant fuel savings. Fitting multiple engines into the narrow twin hulls of catamarans always presents challenges. The designers of the Sea Scout have an elegant solution. The larger engines are set forward in each hull with an ultra-light weight carbon fiber shaft running aft from the ZF 3055A gears (2.25:1) to the propellers. A generator set is mounted laterally across the hull just aft of the big engine on an elevated platform. At a lower level and aft of that, the smaller engine is mounted with a carbon fiber shaft running forward to a ZF550 V-drive gear mounted in space under the gen set in such a way that the propulsion shaft can pass back under the engine to its propeller. A shaft brake is mounted on the tail shaft to lock up the propeller when not in use. ZF provided all components from the engine flywheels aft to the rudders as well as the control system. Sea trials have shown that locking the smaller shafts can cause greater fuel consumption at some speeds when running all four engines. With this complexity of propulsion it is likely that it will require some experimentation to find the optimum combination for various speed and survey requirements. Capt. Jeramie Rivette will pilot the vessel from the builders in Puget Sound south through the Panama Canal and up to Louisiana. He is expecting to cruise at about 15 knots on the voyage. He reports that sea trials showed, that making 23 knots with all four engines, fuel consumption was 180 gallons per hour but dropped to just 60 gph at 15 knots. On arrival in the Gulf of Mexico the Sea Scout will begin work under contract to NOAA mapping near shore sea bottom. With a 37.4-foot (10.8-meter) beam there is room to provide good accommodation for a total of 26 people; the vessel crew will typically be four people plus a cook. This leaves up to 21 bunks available for survey technicians. To feed this many people the boat has a good size galley and mess area. The vessel will also carry a cook, Mark Quinney, who is well versed in Louisiana style cooking from gumbo to pralines and fried chicken. To work off the calories, one of the hulls is fitted with a small gym with its own shower. Aft of the wheelhouse on the second deck, the scientific lab supports an array of computer screens that display the feed from the transducers mounted on a special section on each hull. Initially these include a Simrad EK60 38Hz fisheries sounder, (2) Odom MKIII single beam (200/24 kHz), Kongsberg EM30002D multibeam sounder (in Wesmar retractable hoist), Kongsberg HiPAP 501 USBL acoustic positioning system, Kongsberg Geopulse sub-bottom (profiler 4x4 array), Accommodations for Kongsberg EM302 2x4 multibeam sounder. Vessels doing extensive sonar surveys benefit from an ability to reduce the number of engines operating – either diesel-electric or, as with the Sea Scout, a pair of smaller propulsion engines. Of equal importance is a hull that will not set up turbulence that could interfere with the sonar signals. The Sea Scout has pods mounted on the bottom of each hull below the keel. These contain cavities into which the various transducers listed above, are fitted. Wiring then brings the signal directly to the operations room. Lab equipment includes (2) C-Nav 3050 BPS receivers plus C-Navigator control unit, a Coda F180 Inertial navigation unit, a Kongsberg MRU5 (for HiPAP) and (2) YSI velocity sensors. For specialized transducers that may be required by chartering parties, a leg that can be raised and lowered through an opening in the deck just aft of the main house can be used. Offering a wide range of geophysical services to government and industry in the Gulf of Mexico and Brazilian waters, C&C Technologies has a great depth of experience in defining successful hull forms. There are two interrelated criteria for which Teknicraft designed the Sea Scout hulls. A clean flow of water over the keels and transducers assures an accurate recording of data. At the same time, maintaining this clean flow at increased speed reduces the cost of collecting data. For inshore work, a shallow draft is also desirable. The Sea Scout meets these demands with a relatively shallow 6.5-foot ( 2-meter ) draft and two finely shaped hulls each capable of supporting an array of transducers. The decision was made not to install bow thrusters on the vessel. Although this precluded dynamic positioning, it was felt that the thruster tunnel would create turbulence on the bow that could distort data collection. The extensive experience of C&C (http://www.cctechnol.com/) combined with the Teknicraft design ( www.teknicraft.com ) and the ability of All American’s aluminum building expertise (www.allamericanmarine.com/ ) will make the Sea Scout one of the more noteworthy vessels of the year.